The US Supreme Court issued a strong 6-2 ruling on April 29, 2014 which upheld proposed EPA regulations to regulate air pollution that crosses state boundaries under the Clean Air Act known as the “Cross-State Air Pollution Rules,”(Rules). The Rules require 27 states in the eastern half of the United States to significantly improve air quality by reducing power plant emissions that cross state lines and contribute to ground-level ozone and fine particle pollution in other states. 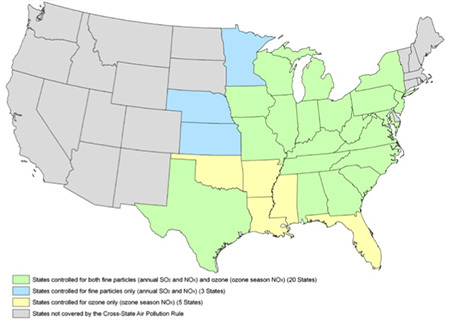 The map below highlights the states where reductions in fine particles and ozone are required under the Rules in the eastern US. The Rules are premised on the concept that when a power plant or other major pollution source emits carbon dioxide, soot, sulfur dioxide, nitrogen oxide, and mercury, those pollutants don’t stay put inside the borders of any particular state. Fourteen states had sued the EPA along with numerous power companies over these rules over concern of adverse impacts on their power facilities and industry. Seven of the states challenging the rule were in the South including Alabama, Florida, Georgia, Louisiana, South Carolina, and Texas. The DC Circuit had struck down proposed Rules on the basis that they were too harsh on the upwind states and failed to specify how these states must address the air pollution. The Supreme Court decision upheld the agency’s authority to implement and refine these regulatory requirements. Now that the Supreme Court has upheld the Rules, the EPA will decide more specifically how the rule will become operational. Now that the rule has been upheld, states must focus on implementing their own standards to reduce the air emissions and power plants must reduce emissions of SO2 and NOX. Many commentators have opined that this rule will effectively eliminate the use of coal for power plant operation. As many power plants in the South have previously commenced converting to natural gas, the effective impact of these rules is uncertain. The further implementation of these Rules, however, requires close observation by all industry that has significant air emissions.